I pop my toes every once in a while to release pressure in my feet and normally it helps, but three days ago I had my boyfriend pop my toes for me and when my big toe popped, it immediately hurt. It's been a few days and is big and swollen with no bruising but just feels more and more broken as time goes by. It's pretty isolated in the ball of my foot and feels like it has to pop really bad. Now, the pain has been getting worse and I cannot even bend my toe without it causing a terrible pain to shoot through my whole foot. I ice it every night for like 30-45 minutes every night before bed. The kicker is I work 8 hour shifts as a checker in a grocery store so resting all day isn't an option. Can you maybe tell me or guess-timate what this might be and perhaps how long it might take to heal? Although I can never be sure of anything when it comes to giving advice sight unseen from the other side of the internet, I am fairly sure you did not break anything. The force necessary to break a bone would be far greater than the force your boyfriend used to "pop" your toes. I assume by popping your toes, he just pulled the toe forward, perhaps with a greater pull than you normally do and so now you have pain. My guess would be that he did some damage to the ligaments that hold bones together (red arrow). A ligament is a leather like material that attaches, in this case, the toe bone to the first metatarsal bone which makes up the big toe joint. The purpose of this ligament is to maintain alignment of the two bones so the joint works properly. The problem here is that there is not much "wiggle room" with how far a ligament will stretch, in fact its very limited. The is the same mechanism as when you sprain your ankle. In this instance the ligaments holding the foot bones to the ankle bones become stretched and you end up with pain and swelling. heal than a strained ligament. 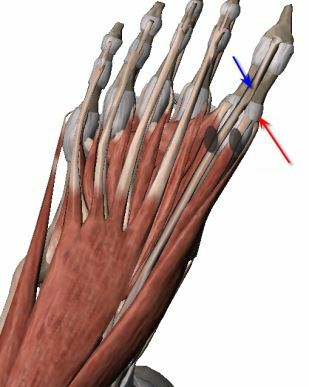 The other possibility is that you strained one of the tendons that controls your big toe, allowing it to either bend up of bend down (blue arrow). If this is the case then you would probably have pain either on the top of the foot, or, the bottom of the foot in the area of the big toe joint. This condition as well will cause swelling (and pain). Now, a final possibility is that you did damage to the sesamoid bones which are on the bottom of the foot in the area of the big toe joint, (two black circles). These are two small oval bones that help tendons on the bottom of the foot work more effectively. They are attached to the larger metatarsal bones with ligaments as well and by pulling the big toe forward, you may have damaged the sesamoids as well. If this is the case, then your time frame for healing will be further delayed because a sesamoiditis can be a real problem curing, particularly if you stand all day as you stated. So what can you try to do to improve your problem? Seeing a local foot specialist would be my primary advice, but if you want you can try a couple of things first for a few days with the understanding that if things do not improve, a doctors visit will be necessary. First, try and wear the most rigid shoe possible, the less the shoe bends in the ball of the foot, the less the toe is forced to bend and the less pain you will experience. Also by limiting the bending of the joint, it allows the ligaments and tendon to heal faster. Secondly, only if you can tolerate them, try taking an anti-inflammatory medication, like Advil, Aleve or Motrin. Take them on a regular schedule as instructed on the package, do not exceed the recommend dose. This will help reduce the inflammation and make you more comfortable. Lastly, I would switch to moist heat and stop using ice. I am a believer that after 24 hours, heat is more effective than ice in helping improve a musculo-skeletal problem. You can try this for a few days, obviously staying off your foot would also be helpful, if you can. If you do not see substantial improvement then as I said earlier, a visit to a foot specialist would be in order.